Consult with a tax attorney regarding your eligibility for the aforementioned incentives. Summit Community Solar makes no guarantees about the availability of incentives or participant ability to take advantage of the incentives. Solar energy generation systems are a fantastic investment, but the upfront cost they require can be a hurdle. Solar financing can help lower your upfront cost and make rooftop solar even more affordable. Don't forget to check with your bank or credit union to see what residential solar financing options they may have available. 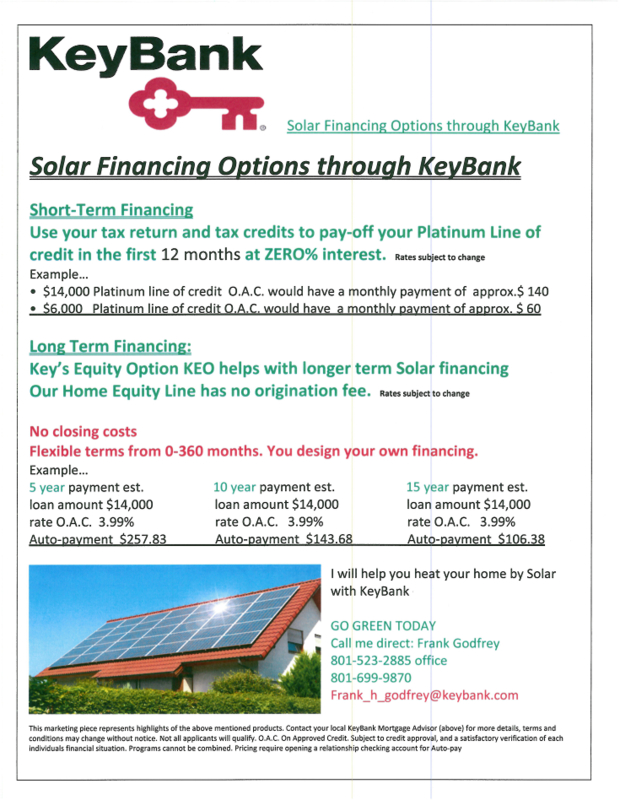 Your bank or credit union may offer financing options for renewable energy or for home improvement projects. This information is presented as a community service. Utah Clean Energy, Summit Community Power Works, and other program partners do not endorse specific financiers or financial products.